According to the National Eating Disorder Association, eating disorders affect people of all ages, backgrounds, and socioeconomic statuses. 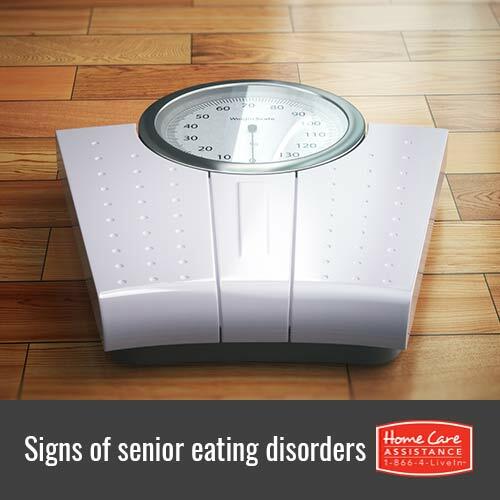 Even seniors can be affected by eating disorders for any number of reasons, which can lead to serious health consequences. If you are concerned about your elderly parent’s eating habits, Oshkosh live-in home care providers can help. Here are some red flags that indicate your loved one has an eating disorder. Anorexia, bulimia, binge eating and other disorders can cause huge changes in body weight. While some weight changes may be the result of other health issues or medications, major increases or decreases in weight shouldn’t be ignored. Those with eating disorders will often go to great lengths to hide it. If your loved one is shying away from family dinners and lunch with friends or turns down every offer for food, an eating disorder may be the problem. If your parent is starting to restrict his or her caloric intake, you may notice that he or she has become a picky eater. While some of this might be blamed on tooth pain or digestive upset as your parent ages, be wary if he or she starts to reject entire food groups or is refusing all forms of fat or sugar. Eating disorders can lead to lengthy routines, especially if bingeing, purging or over-exercising are involved. If your previously social parent is now spending lots of time alone, an eating disorder may be the reason. In cases like this, seniors will benefit from elder home care Oshkosh families can trust. If you’re concerned about a parent’s eating habits, have a frank discussion with him or her and talk to a doctor. Eating disorders are serious but with help from therapists and in-home caregivers, seniors can overcome them. Home Care Assistance provides comprehensive Alzheimer’s, Parkinson’s, stroke, and Oshkosh dementia home care to promote senior health and wellness. In addition personal care assistance, our highly trained caregivers also help prepare nutritious meals for seniors. Schedule your free consultation today when you call (920) 710-2273 and speak to a friendly Care Manager.